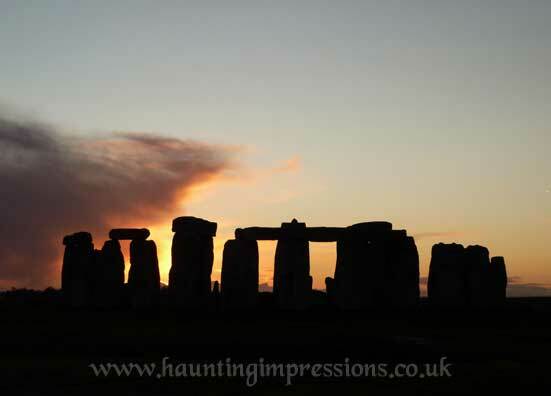 Haunting Impressions is based in the west of England. 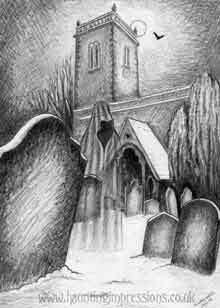 We specialise in designing spooky images for greeting cards and prints. These designs have been produced from a love of the supernatural and the thrill it can bring. 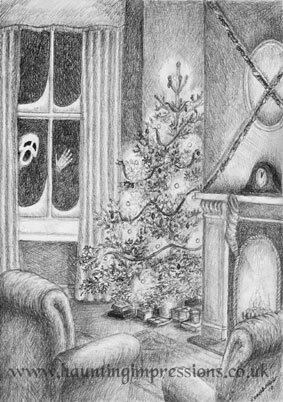 One Christmas the artist was inspired to send a very different sort of greeting, developed the idea of producing a range of ghostly cards. "I grew up with ghosts – I don’t mean I lived in a haunted house but rather I was surrounded by stories. My parents were from different backgrounds, one Mediterranean the other eastern european, and the mix of tales about ghosts, werewolves, vampires (and worse) was captivating. From childhood I have drawn these things, and designing these spooky scenes has given me a great deal of pleasure. I hope you find them ... unsettling"
Many of the designs have a story or history behind them. Read on to discover more. A twilight scene in a cemetery, grave stones and memorial statues. Then one figure turns around and it's not made of stone at all. The background is a composite of several locations but it most resembles Nunhead Cemetery in south east London. 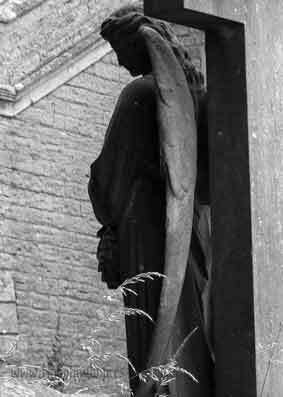 Statues such as the angel type figures that are encountered in cemeteries can be disturbing - as recent British scifi on television demonstrates. They probably fit into the same psychological zone as portraits and dolls - anything that is a representation of a living thing has the potential to become living in the mind of the viewer. 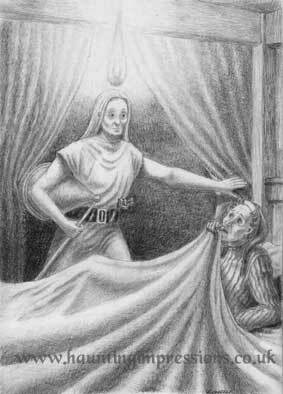 So horrific tales of pictures with eyes that follow you as you move around the room, dolls coming alive and statues that move are common in the imaginative realm. From out of the fog appears this strange mummy like figure. It reaches out to you. Behind are ruins based on Llanthony Priory in the Black Mountains in Wales. It's a compelling figure - is it the sucked in holes for eyes or the dessicated skin? It appeared almost by accident on the page and took on a life of its own. Stuff of nightmares. 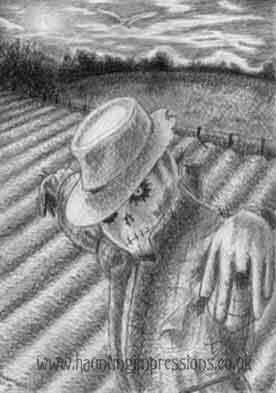 The lonely figure on the landscape, the scarecrow is sometimes endowed with mystery and even horror. We are receptive to the idea of one coming alive and it is a motif not uncommon in popular culture, from Doctor Who to Worzel Gummage. Robert Westall wrote a rather spooky piece called 'The Scarecrows' too. Many people find this picture too menacing to be comfortable. When the curtains are drawn are you safe or are you enclosed and trapped? Many of my ghosts wear a traditional white sheet and are skeletal underneath. The idea of the cloth covering comes from the burial shroud in which people were laid to rest before coffin burials became more common and affordable in the Victorian period. 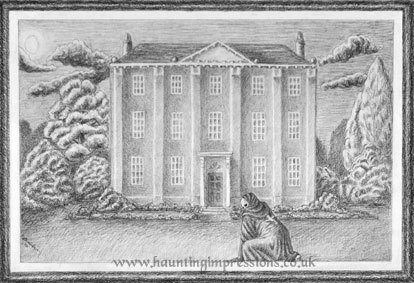 The Dark Stair is reminiscent of the famous photograph of the Brown Lady of Raynham Hall. 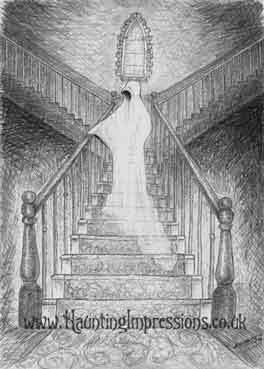 Originally this design was based upon experiences of a ghostly presence which seemed to hang around the top of the stairs in my family home. It wasn't until the house was sold and we reminisced about growing up there that it came to light that all my family had the same dread of the top few steps and a couple even claimed to have seen something. 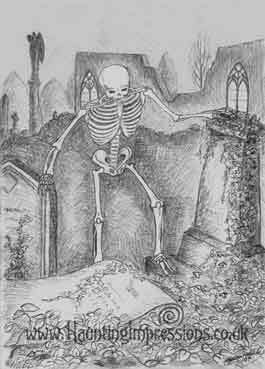 The Bones of Nunhead is set in a real cemetery in south east London. Consecrated in 1840, it is one of the sister cemeteries to the more famous Highgate. Behind the main figure are many of the elements which can normally be seen in Nunhead. If you would like to know more about Nunhead Cemetery you can visit the Friends of Nunhead web site, see my Links page. Is it just the waves breaking or can you see the dead rise within the foam? The motif of creatures emerging from the surf is well known but I think it's a device that particularly lends itself to the supernatural as well. The cove like coastline could be reminiscent of Cornwall or more likely West Wales where I lived for many years. Nunhead Cemetery is located in South East London and is a fine example of a Victorian Cemetery. It is a fantastic mixture of formal avenues and monuments as well as small headstones scattered along overgrown winding paths, covered in ivy and hidden by trees. 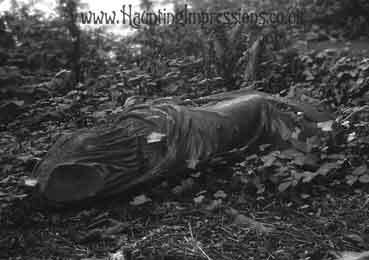 This once monumental sculpture although sadly missing arms and head, lies on the ground slowly grown over by ivy. Next to the ruins of the chapel near by, she adds to the impression of decay and times past. To find out more about Nunhead Cemetery, visit the Friends of Nunhead website. In the neighbourhood of Cowley in Oxford lies a small church yard with some unusual headstones. There are four in total and they probably date from the 18th century. 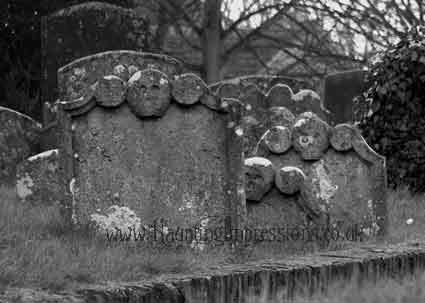 Each headstone appears to have its own character and make fantastic if not slightly gloomy pictures. Just to the north of Canterbury in Kent is Blean Woods. A wildlife haven partly owned and managed by the National Trust, it is an ancient woodland that is important locally and nationally as a nature reserve. 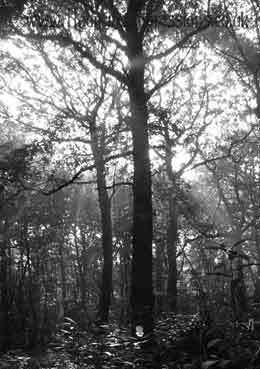 This atmospheric photograph was taken in the early autumn when the woods were full of fungi and fallen chestnuts and the leaves were only just turning gold. 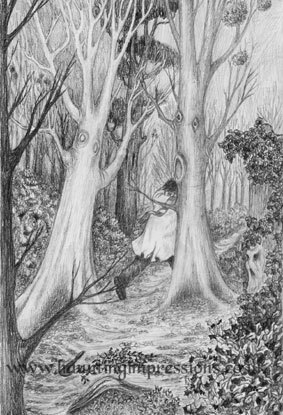 In the darkened woods shafts of light penetrate to give an errie and magical scene, this triad of trees appear more like figures looming above the scene, observing. 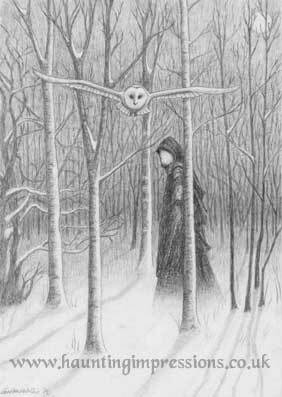 Woods and forests often have strange stories and histories associated with them. The are a very closed in worlds where vision is limited and there are small strange sounds. The muffled quiet is very disturbing if you think you are not alone - and I am not referring to the local wildlife. My father told an amazing and terrifying story of travelling home at night through the wild forests of Serbia in the snow. What he encountered there was reminiscent of a Denis Wheatley novel. This statue was happened upon by chance from the road whilst walking through the small village of Bushley Green, Worcestershire. Many prehistoric monuments in the British Isles are aligned on the mid winter sun. Often they are burial sites, suggesting a link between the solstice and the dead. Newgrange and Maes Howe are burial mounds where the entrances were blocked but a small space was deliberately left open to the sun above the entrance, at Newgrange a special box was constructed just for this. The sun passes this at sunset or sunrise (depending on the direction of the monument) for almost 2 weeks either side of the shortest day. The importance of the winter sun light, shining into the tomb long after any possible living persons had gone, suggests a possible belief in the return of the dead. surrounded by a landscape burial mounds was a place of the dead. Both show an alignment to the winter sun. The photographs were taken in 2011. 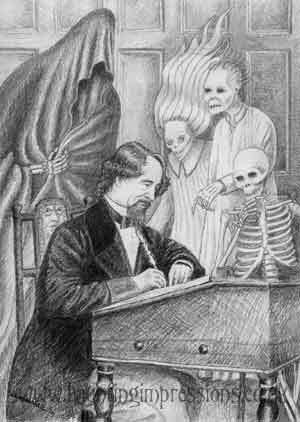 Dickens loved a ghost story and owed this fascination for the supernatural to his nurse Mary Weller who terrified him with many tales. I was struck when reading a collection of his supernatural stories how many were in fact concerned with premonition and portent (To Be Read at Dusk, The Signalman), sometimes ghosts were sometimes concerned with vengence or seeing that justice is done (The Trial for Murder). 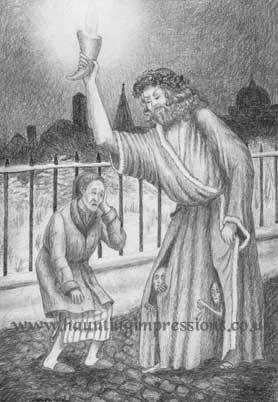 Dickens doesn’t often describe his spectres in any great detail or the scene at the moment of terror which makes them harder to illustrate. 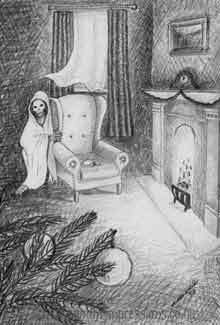 I took two images from A Christmas Carol - of some of the more frightening scenes. 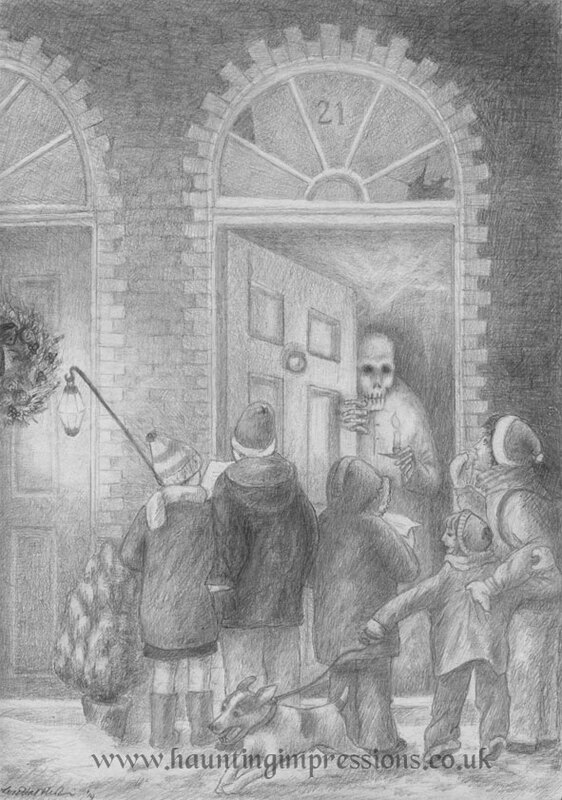 The very first ghostly occurrence when Scrooge arrives home and his door knocker … well, it is a creepy moment. 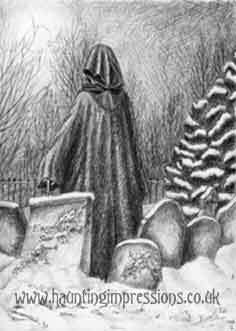 The Spirit of Christmas Yet to Come is the most sinister figure in his Reaper type apparel - which is justified when he reveals the inevitable future to Scrooge in the grave yard. 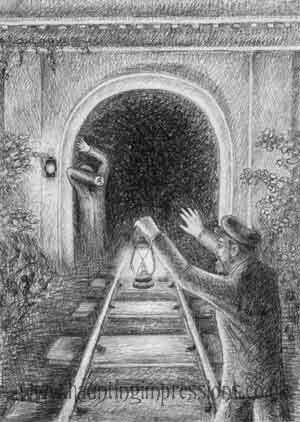 The other image is taken from The Signalman which is one of the best ghost stories. I collected a few of the apparitions together with the author - including the ghost from the ‘Queer Chair’ for the last picture. The two remaining spirits have been added so all three ghosts of Christmas are now represented. M.R. James was an antiquarian (1862-1936) but is best known for his ghost stories, published from the start of the 20th century. Many were written as entertainment at gatherings on Christmas Eve. To be read aloud. There have been several adaptations for television of his work - and these can still sometimes be seen around Christmas. 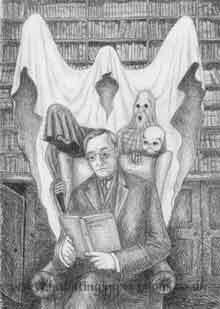 I have produced a set of 4 designs on an M. R. James theme. 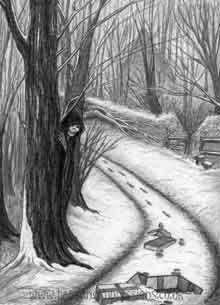 The Mezzotint is a story about a picture and the spectre that appears in the picture. The events of many years previous are re-enacted in the image. 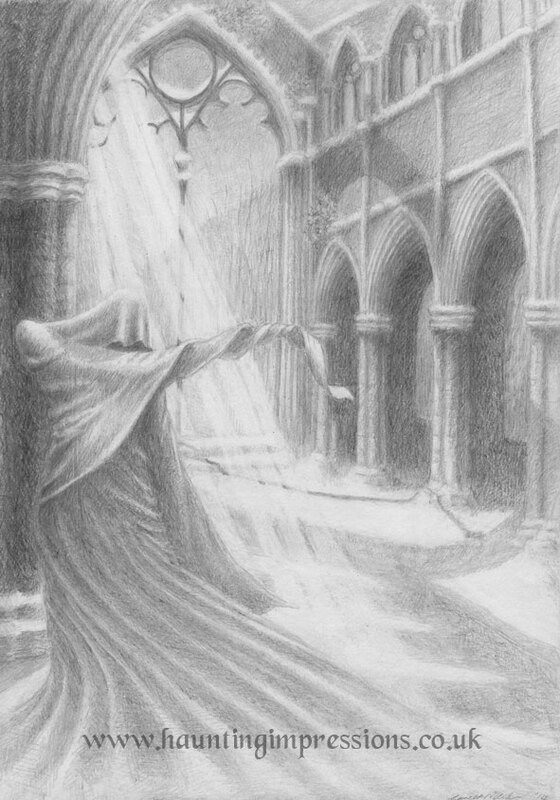 Here the spectre is approaching the house, as he appears early on in the tale. I turned his head very slightly as if he is aware of the viewer, though this is my own interpretation of the scene. 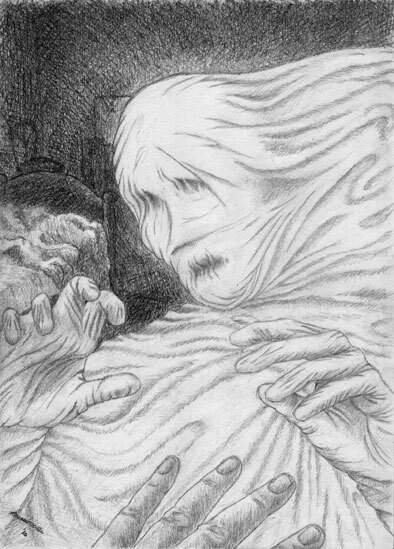 In the final scene of 'Oh Whistle and I'll come to you' the spectre is described as having 'a face of crumpled linen'. It has made for itself a body out of some bedsheets and the blind phantom towards its victim. This is a very different phantom to the earlier image I created although it more closely resembles the form I first imagined when I read the story. Oh Whistle and I'll come to you is one of James's most popular stories. 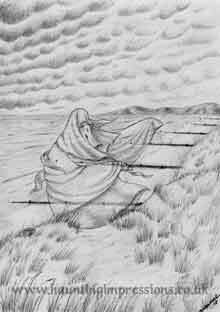 The image is based on a dream where the main character watches a scene unfold on a beach: a man is pursued by a figure in 'white fluttering draperies'. In the book the figures appear on the sand but I set the figure on the dunes as it allowed a better view of the groins and beach. The ghost is supposed to be blind and this was quite a challenge to represent. In the end I opted to show the eye holes in the face sheet as stitched up. Rats is a fairly creepy tale which has little to do with rodents. 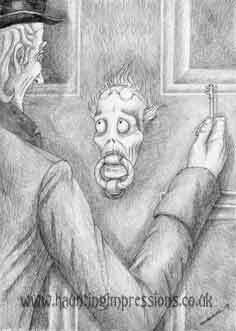 My friend here is seen towards the climax of the book, as the over curious guest in the lodging house gets into the locked room to see what is really on the bed and gets a shock. The scene is quite faithful to the book except for one small detail. He is quite a sinister looking character, quite enough to put you off your Christmas dinner and in the book he is in chains. When I attempted to show these the figure took on an unpleasant dimension, it took the scene to an even darker place of suffering. In the end I decided he looked much happier without the chains. A Warning to the Curious is also one of the better known stories and is based around the common Jamesian theme of unrestrained curiosity or antiquarians reaching beyond their limits. 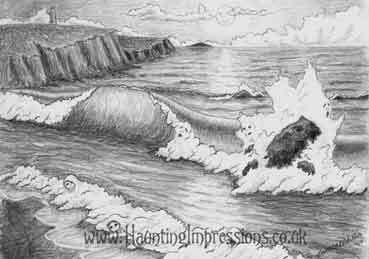 It is set in Seaburgh on the Suffolk coast, which is based on a real place: Aldburgh. I have recently been a visitor although I didn't notice any barrows there. 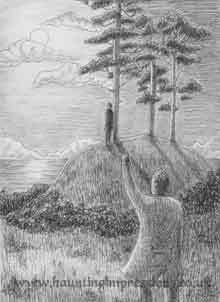 The scene is moonlit, after returning the crown to its resting place, something is seen on the mound and one of the characters thinks they have left a coat up there. 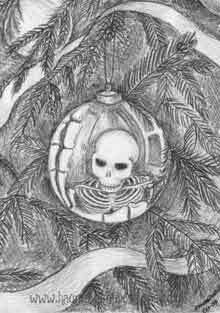 This was the very first design created for Christmas. It is actually reminiscent of a room in my family house which retained an open fire place and was lit on a few special occasions like Christmas. 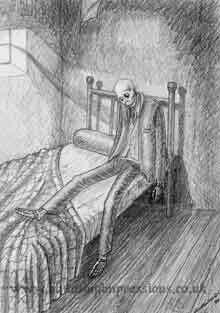 The ghost is wearing the traditional burial shroud and clasps the chair with his skeletal hand as he peers round from his hiding place. His presence is only suggested by the fluttering curtain in the ethereal wind. Two of the cards are based around the Christmas tree. 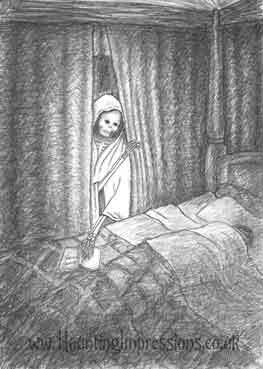 The reflected skeleton was suggested by a friend who thought this a terrifying prospect. Victorian style candles made a bit of a come back in recent years - much to the dismay of the fire service. 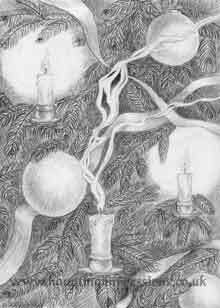 The candle light would have been a very different experience on a tree from a string of electric lights. Ghostly faces have sometimes been depicted in the flame of candles but the winding, flowing, random form of the smoke from an extinguished candle gave me the inspiration to create this image. 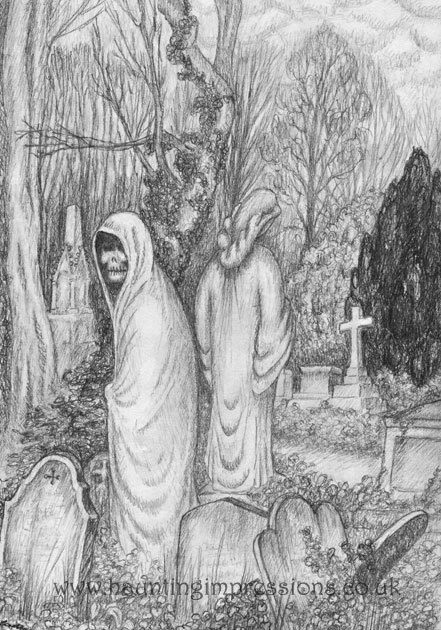 The ghost standing amongst the grave stones is based around some very scary photographs of specters who hide their faces like this one. See the spectre of Newby church for a chill. The location shown on the left is from the church yard at Abbotts Bromley in Staffordshire. As far as I know this is not haunted. The lastest cards for Christmas show on the left a scene in woodland, some one has been collecting holly and mistletoe until something spooks him. Woodland as the light fades can be scary places especially as here, faces appear in the trees. Perhaps they don't want people helping themselves - that's why I've subtitled it 'Druid's Beware'. On the right a traditional fireside scene, christmas tree and presents and stocking hung up. At the window the snow clings to the pane, but it looks like there will be more than Father Christmas coming to visit this year. 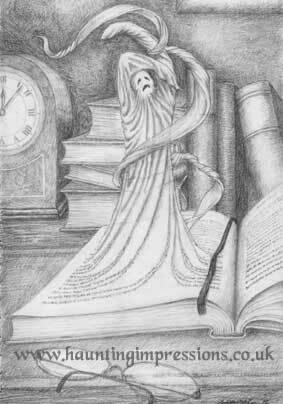 A ghost rising out of the pages of the story that created it. Twisted around the figure is part of its winding sheet, wailing and writhing, the very words created its form as they swirl from the page. The image on the right is reminiscent of the ghost in the church yard, this time it is a dark figure moving through the snow. You appear to have disturbed both it and the owl. 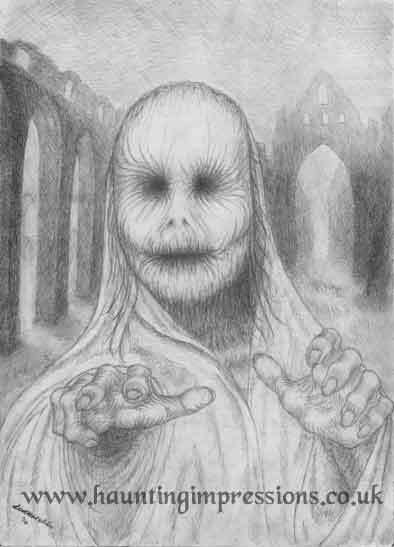 As it looks towards you its face is completely covered by a cloth, which suggests ... well, I don't like to dwell. New for 2014, one quiet and atmospheric, the other a creepy turn on a Christmas tradition. But judging by the state of the building perhaps they shouldn't have been tempted to knock. If some aspect of the image on the left look familiar it may be because it is based on Tintern Abbey. I don't know of any tradition of cowled figures appearing there but I'd be interested to hear.